One month before the regional championships, we raced at the College Station to test the course and our shape. 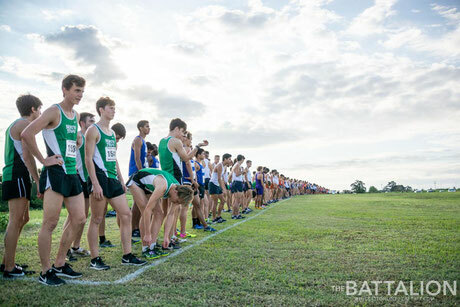 The inaugural Arturo Barrios Invitational had an impressive line up: Most universities from Texas were toeing the line and were challenged by some prestigious schools like Guelph (Canada), Oklahoma State, Tennessee, Florida etc. My team, North Texas, got starting box number 35, which was was on the far right side of the course, with a first right turn, on our side. The race went out fast as expected but since the starting straight was around 800m long, there was enough time to place myself in the perfect position. I went into the turn in around 25th position and was able to relax in the following kilometers. I passed the 2k marker in 6:04, just one second behind the leader and still felt really comfortable. But from one moment to the other, at like 5k, I had a surprising low and lost some time to the leading back. As it seemed, there were many runner struggling at that part of the race because I barely lost any places even though my pace dropped for a few kilometers. On the final 1000m, I was able to gather myself for a bit and could catch some runners right in front of me and I finished in 17th position. My team finished in a satisfying 8th place, even though our race was far from normal. We just finished five of eight runners, with one team mate having a heat stroke just 300m from the finish line. Luckily, he is feeling much better now and he will be back for our next race. Even though I am not fully satisfied with this result, I know that I am on the right track to be in a really good shape for the important races of the season. Next stop, is Conference USA Championships in Florida!